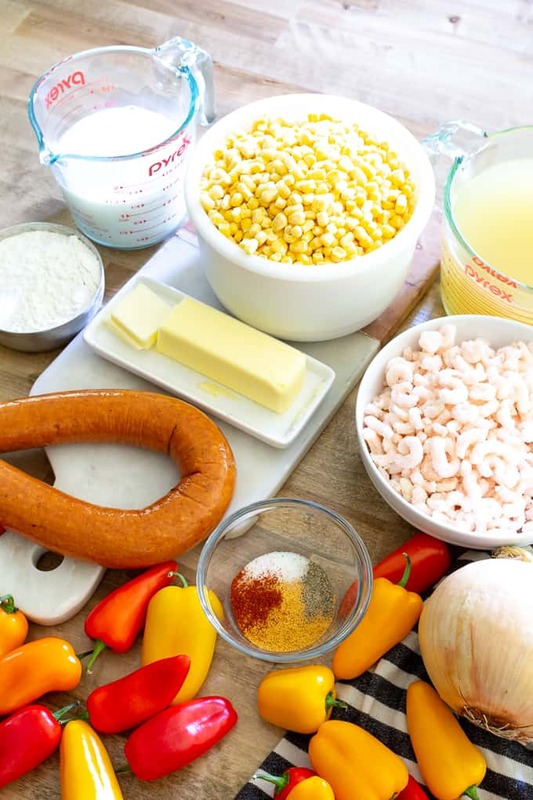 Years ago I clipped a shrimp and corn chowder recipe from the Sunday newspaper, and I’ve been tweaking the recipe ever since. Finally I decided it’s about time to share it with you all! 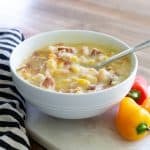 This shrimp and sausage chowder is one that everyone loves, and can be as mild or spicy as you desire. As it’s been gets colder I find myself craving warm hearty soups. My husband is of the mindset that “soup” is a side, not an entree… that is unless I really beef it up like this chowder. By adding lots of sausage and shrimp it makes for a hearty soup that doesn’t get any complaints. The best part of this recipe is that it can all be made in one pot. From browning the meat, to sweating the veggies, creating the roux, and simmering. It can also be as mild or as spicy as you want by controlling the amount of cayenne. One teaspoon of cayenne is just enough to give it some flavor without making it too spicy for my kids. This is a thick and hearty one pot meal. In a large stockpot, heat the olive oil. Add the sliced sausage and cook until browned. Add in mini peppers and onion. Season with salt, pepper, seasoned salt, and cayenne. Cook until veggies are softened. Add butter and melt. Once it is melted add flour and then milk. Stir and Bring to a simmer. Reduce to low and allow to thicken. Add corn and let simmer for 20 minutes. Reduce to low and add shrimp, simmer just until shrimp is warm. This makes a pretty large pot of soup and typically when I make this I serve half and freeze the other half. This way we aren’t sick of the leftovers and it reheats really well. I hope your family enjoys this recipe as much as we do! 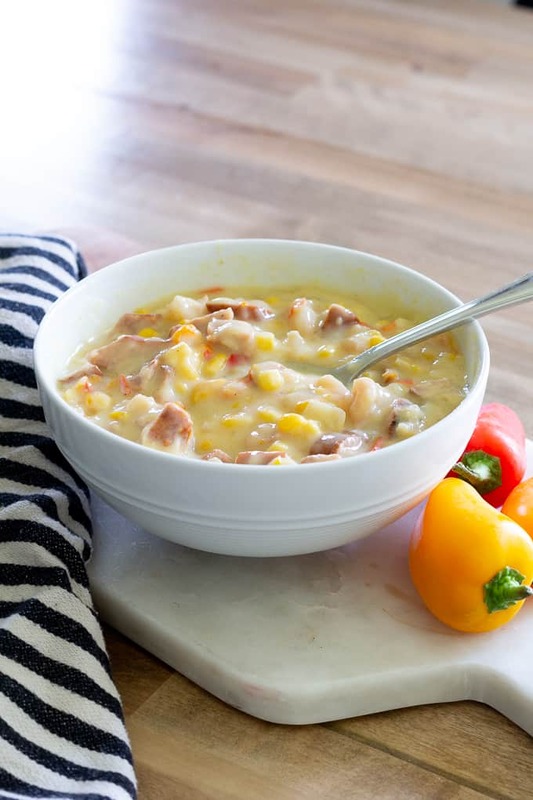 **Also** if you love this recipe you might also love my wild rice soup recipe and my white chicken chili! 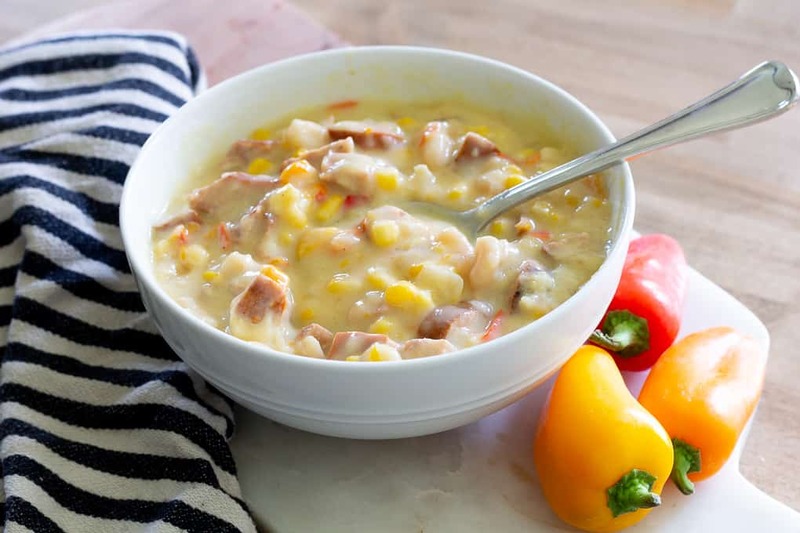 I love corn chowder, so I am eager to try your take on it. And I am a Cajun, originally from south Louisiana so the andouille and cayenne will definitely fit my taste buds. BTW, I am assuming that you add the chicken stock when you add the milk? Thanks, have a great Thanksgiving. I have not made this recipe yet, but it looks and sounds delicious. Like Tina, I too noticed that the instructions as to when to add the chicken stock were missing. My guess is that it would be added after step 3 once the milk and flour mixture has had a chance to thicken (i.e. 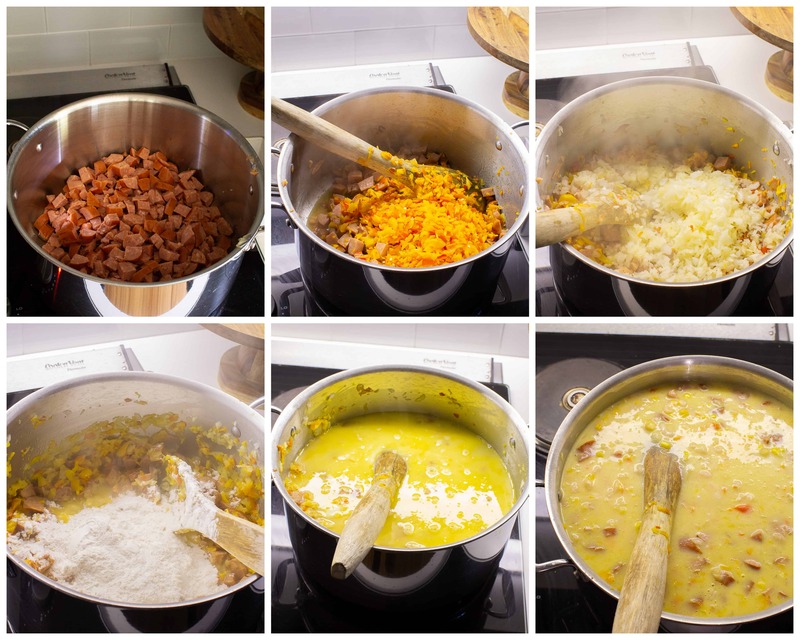 when adding the corn in step 4). Looking forward to trying it!